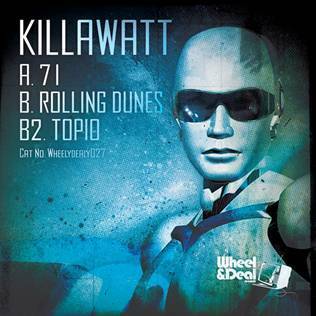 Wheel & Deal bring on board one of the most exciting dubstep producers in the UK today, Killawatt, as he unleashes three slabs of aural intent. ‘71’ seeps in with sparse atmospherics and distant vocals to set the mood as the break kicks into action with deep boom bass and a morphing mid-range that twists throughout. It’s crafted with subtle touches to create a very accomplished piece of music. Next up is ‘Rolling Dune’ which as the title suggests is a cinematic slice of spiced up beats and bass that’ll have faces wincing the world over when it drops. It’s all about the crunching b-line that grabs and never lets go as the haunting pads keep the paranoia stakes high. ‘Topio’ is another that hits hard with incredible sub to shake the bass stacks good and proper. Out now.